Grandma’s Dutch Peach Cake is a simple six ingredient cake, topped with fresh perfectly-ripe peaches, a dash of cinnamon sugar, and baked to perfection. The beauty of this light “cake” is that it’s not sweet, and highlights the fruit of the season. In fact the sweetness comes from the fruit, not the cake, so it’s important to use fresh in-season fruit. So when Whole Foods and Whole Foods Fairfield County sent me the juiciest cherries ? and peaches ? 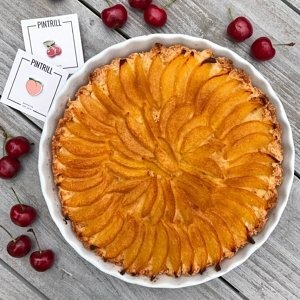 along with the cutest fruity pins from Pintrill, I couldn’t wait to make the first Dutch Peach Cake of the season! It’s a family favorite that works well as dessert, snack or… you could even eat it for breakfast… I won’t tell. Sponsored post in partnership with Whole Foods. This is a simple six ingredient cake, topped with peaches, a dash of cinnamon sugar and baked to perfection. The beauty of this light "cake" is that it’s not sweet, and highlights the fruit of the season.